So I really enjoying watching 'What's in My Make-up Bag' videos on Youtube and I love reading about it too. It is interesting what other carry with them on a day-to-day basis. I would say I carry a small amount with me. 1. I feel it isn't always essential to carry it with you and 2. 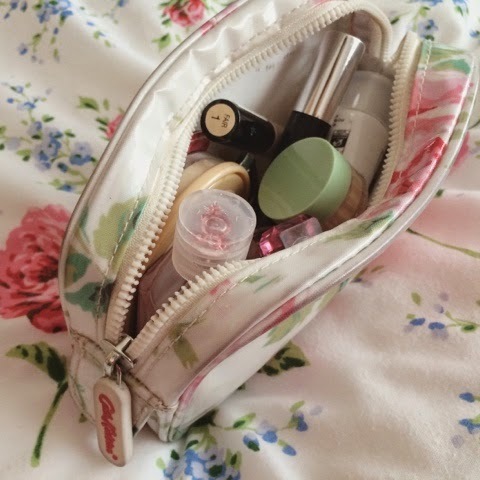 I have a pretty small make-up bag that I can not fit a lot in. My make-up bag was given to me as a gift a few Christmases ago from my parents. I am a massive lover of Cath Kidston so I am in love with it. Like I said it is small but I like to carry the bare necessities with me. A mirror is always essential to carry with you. How many times do you get asked if you have a mirror in you? It is super handy. 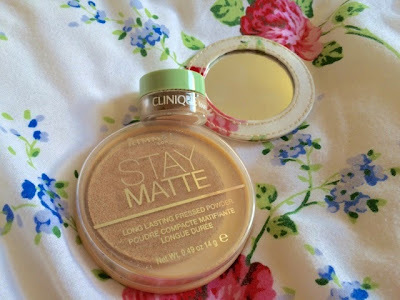 Whether it is for a quick yet or to reapply make-up I need it in my make-up bag. This one was actually already in the make-up bag. I don't have enough space to carry a whole tube of foundation, so I carry around this sample of Clinque Redness Solution Foundation. I am not a big fan of Clinque but it is super easy to carry around this little tub. Rimmel Stay Matte powder is again essential. This, for me, is the best powder I have found so far. I like to carry this with me as well a sponge applicator just in case my face get shiny throughout the day. Collection 2000 concealer. I don't know how many times I have mention this stuff on my blog but it is amazing and I must carry it around with me to touch up my under-eyes or nose. 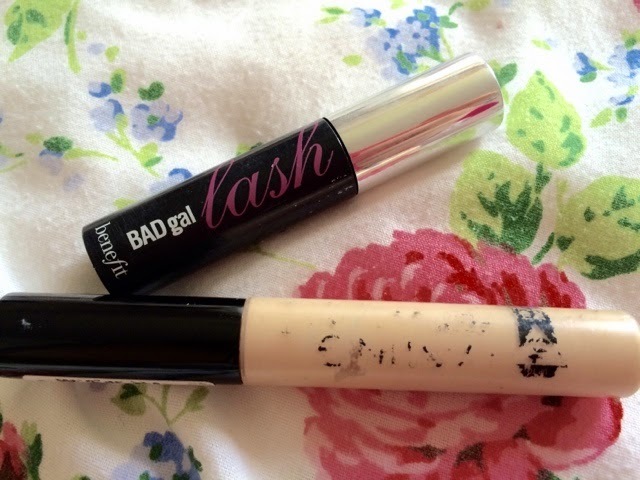 Benefit Bad Girl Mascara. I wouldn't say it was the best mascara from Benefit but it very useful to keep in my bag. It does it job although I am not keen on how big the bristle is compared to the mini size of the bottle but it is for on the go so I can tolerate it. I am however itching to get my hands on Roller lash Mascara. The last three things I fit into my make-up bag is items I use the most where ever I go. 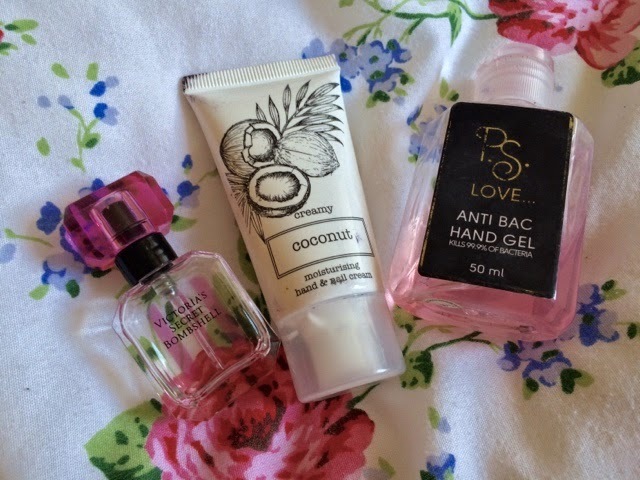 Very recently I have been carrying hand cream, my hand go extremely dry and it started to effect my nails. Since I have been using it everyday my hands and nails have improved a great deal. I really like this smell, I got it in a 4 piece set for my Christmas. The last thing is my tiny Victoria Secret Bombshell perfume. It is so small that I can easily place in my make-up bag. I really love the fragrance and it is always nice to freshen up through the day. Hope you are having a fab weekend what ever you are doing!